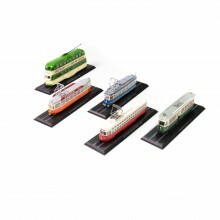 Build your own collection of legendary train and tram diecast models - an absolute must-have for collectors! Start or expand your collection with our exquisite collection of legendary trains. With a Z scale, 1:220, every diecast train displays rich, intricate details and is painted in the original colors. Portraying famous trains all around the globe, our Legendary Trains collection houses a total of 17 different trains, including the Santa Fe Super Chief, the Orient Express 1906, the Trans-Siberian and many, many more. 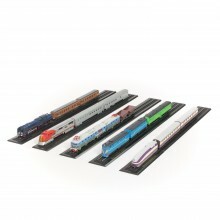 Own a piece of railway history by adding our diecast locomotives and trains to your collection. All models have a metal chassis and come with a turning wheel as well as a base with tracks for elegant display of your trains. Displayed in an exclusive collectors’ box, these famous trains will come with a separate locomotive and car, while diecast trams and locomotives are one-piece items. Our Tee Edelweiss train has a RAM engine, a passenger and dining car, while our Rheingold train comes with a locomotive and a 1st and 2nd class car. To see what cars are included in our legendary diecast trains, browse through the dedicated model specifications before placing your order. If you change your mind, Model Space offer easy, simple returns on all diecast models. Alternatively, if you have another question or wish to alter your order, please read our FAQs for the latest, relevant information on your Model Space orders.